Herman Melville, Bartleby (the Scrivener) (Penguin Books 1995) at 11 [hereinafter cited as Bartleby]. Countless books and articles on modern law practice chronicle the massive sea changes that have occurred in the past 35 years, profoundly disturbing changes that are transforming the future of our profession. See e.g., Macklin Fleming, Lawyers, Money, and Success. The Consequences of Dollar Obsession (Quorum Books 1997) [hereinafter cited as M. Fleming]; Rachel Zahorsky, Majority Say Law Practice is Undergoing a Sweeping Evolution, Survey Says (ABA Journal, March 26, 2010) [hereinafter cited as R. Zahorsky]. I have been a practicing trial lawyer for 35 years, since I passed the bar in 1975 and hung out my own shingle. I can testify. Stephen M. Winnick, Esq. is the founder and senior partner of Winnick & Sullivan LLP (www.winnlaw.com); and the developer of Summary Judgment™(www.summjudg.com), a comprehensive case and practice management software tool built on Eastgate Systems’s Tinderbox data platform (www.eastgate.com/Tinderbox). 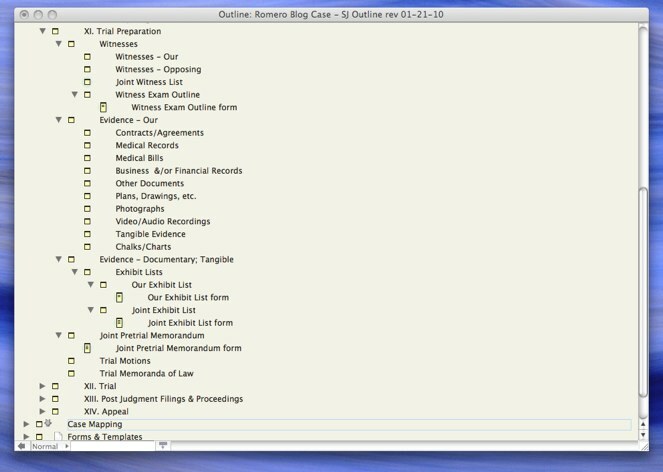 Additional information about Summary Judgment’s features and operation is available in his prior blog series entitledWinvictus’s Summary Judgment – the Romero Case (www.winvictus.wordpress.com). In the prior post – Through The Looking Glass – Part Two – we considered the advice given to Alice in Wonderland: “If you don’t know where you are going, any road will take you there.” This advice is indisputably true. But of course it is not helpful, indeed it is dangerous, if reaching a specific destination – e.g., winning your case; saving a client from certain ruin – is important to you. In this last post to my Romero blog series, we are going to take a different tack, the one offered up at the top by Jimmy Dean, actor and sausagemaker. This aphorism is also true and at the core of effective case management. The facts of a given case may be immutable, like the wind. But by having a firm grasp of your ultimate destination, and the effects of the wind in reaching it, you can adjust your sails to always reach your destination. Let’s see how Dan Hosmer uses Summary Judgment to do just that, in preparing for Carson Romero’s criminal trial for possession and sale of drugs within a school zone. 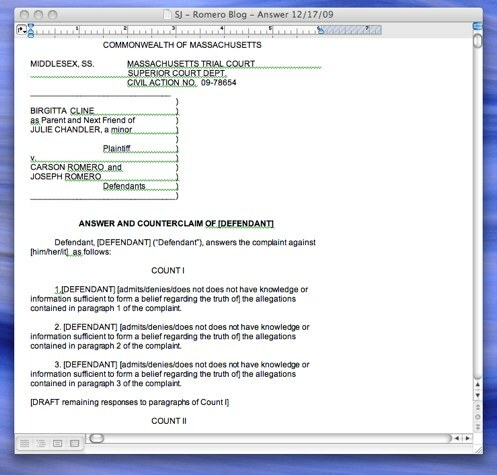 In the process we’ll review many of the key features of Summary Judgment, and explain how to use them in preparing for trial. 1. 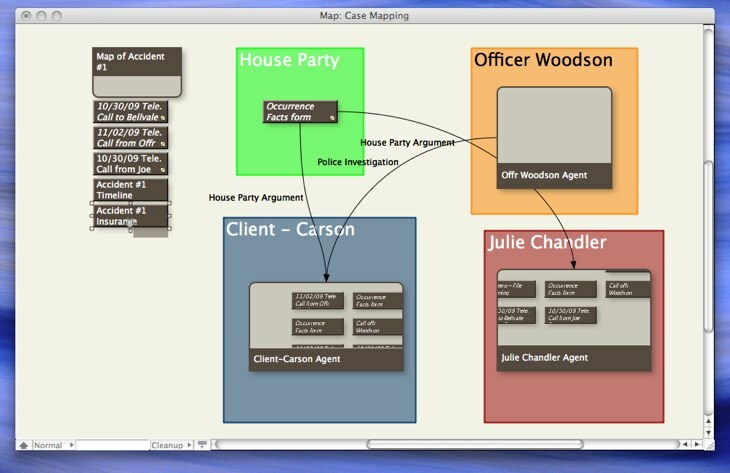 He creates “Agents” to retrieve all of the relevant Case File Notes concerning each actor (e.g., Carson Romero; Julie Chandler; Officer Woodson); and the important events (i.e., the house party located in a school zone where Carson is alleged to have been selling drugs); the first accident outside the house party where Carson is accused of ramming Julie’s car; the second car crash, a single car collision involving Julie , in whose possession the drugs attributed to Carson were found, and which later tested positive at a crime lab). 2. 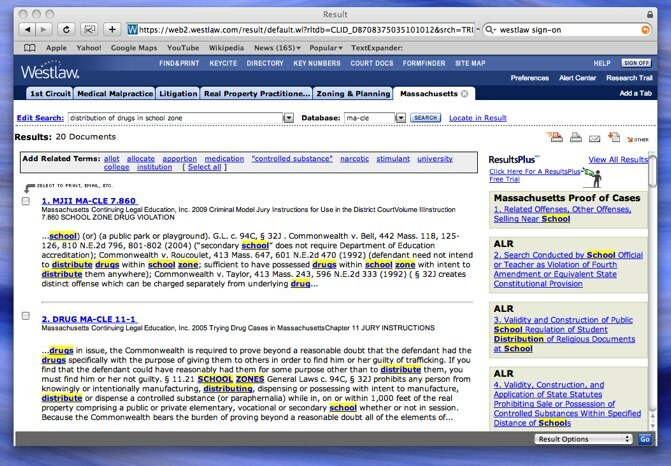 He uses Tinderbox’s powerful “Find” feature, which can search and retrieve any text string (e.g., a word or even a few letters strung together) to search for a few key Notes that he will want to keep separated in his Map for easy reference. 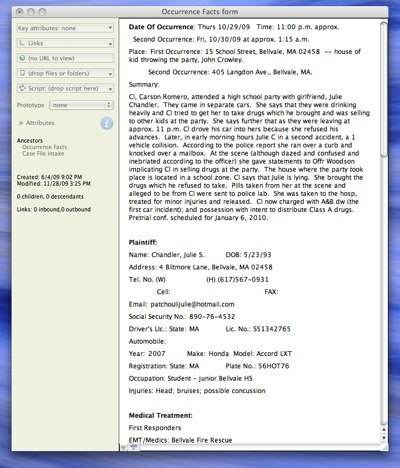 In this case Dan has used the Find feature to locate and retrieve a Note called “Drug Testing Lab Report” into which he had “dropped” a PDF copy of the state police crime lab report of the drugs attributed to Carson. He put that special Note in its own Adornment entitled “Forensic Evidence.” See No.3 below. 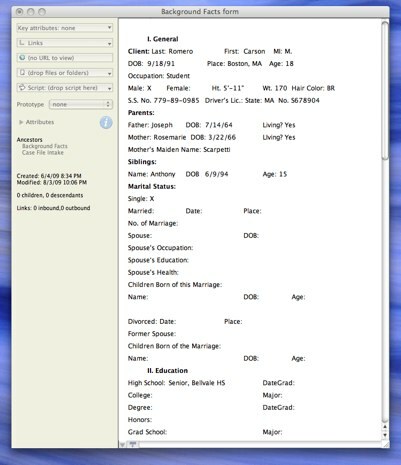 He also uses the Find feature to locate a Note called “Timeline” – which is a chronology and timeline of the case facts which he had prepared as the case unfolded; and also “Poss. w/Intent to Distribute”, which is a Note in which he has stored his legal research concerning the specific offense (e.g., the relevant statute and case law). He puts those special Notes which he may want to refer to repeatedly, near the bottom of his Map where they are handy and can be easily popped open to see their contents. 3. Next he creates “Adornments” (background boxes) to visually distinguish the important elements of his Map, and he gives each Adornment its own title and distinctive color. 4. Then he moves the Agents inside of their applicable Adornments (e.g., House Party; Carson Romero; Julie Chandler, etc.). Because each Agent contains an “Alias” copy of each Note it has retrieved, if while analyzing the case for trial using his Map Dan decides to make changes to any of the Aliases stored inside an Agent, then the original Note in his SJ outline will likewise be changed simultaneously. 5. Finally, when he has all of the Notes inside their Adornments logically structured, he creates visual Links between them, which will help him in developing a coherent trial strategy and effective tactics. Having thought through the issues and obstacles in trying his case, Dan next opens up the Trial Preparation section of the SJ Outline and gets down to business. In it he finds everything he needs to get the case quickly organized and himself prepared for trial, including subfiles for Witnesses and Witness Exam forms for drafting direct and cross examinations of each witness; and Evidence broken down by subcategories (e.g. Contracts/Agreements; Medical Records; Medical Bills; Business &/or Financial Records; Tangible Evidence; Chalks/Charts, etc.). 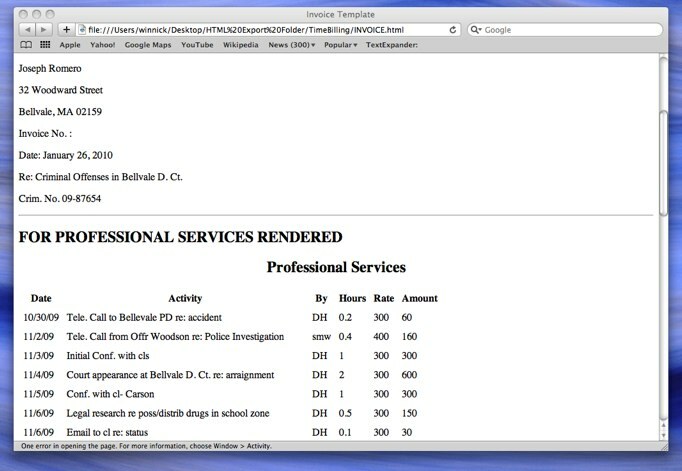 He can easily create and tailor additional subfiles to fit the case proof, and/or remove those that are not relevant. 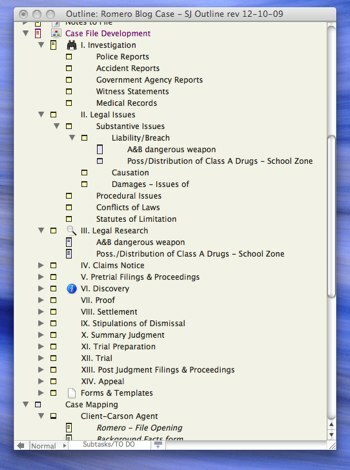 Witness and Exhibit List forms are provided into which the well-organized witness testimony, and evidence, can be easily inserted (e.g., by cutting and pasting). With the Trial Preparation section completed Dan can focus on the Trial itself. 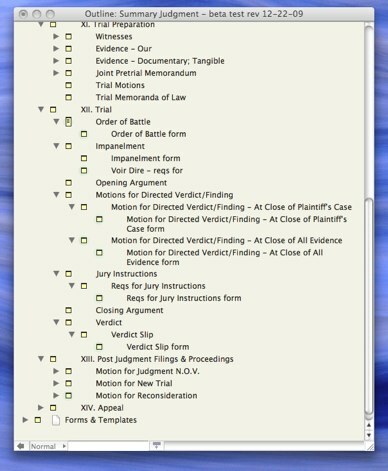 He opens the Trial section of SJ which includes the “Order of Battle” – a handy outline of the anticipated trial elements from pretrial housekeeping matters through verdict/finding; and subfiles covering Impanelment; Opening Statement; Witness Examinations; Motions for Directed Verdict/Finding; Jury Instructions; Closing; and Verdict. Given the outstanding quality of his trial preparation, there is little likelihood that Dan will lose his case. But if worst comes to worst and the outcome is disappointing, Dan will be able to challenge it effectively in the Post Judgment and Appeal sections of SJ which cover everything required to preserve the record and successfully appeal an adverse judgment. 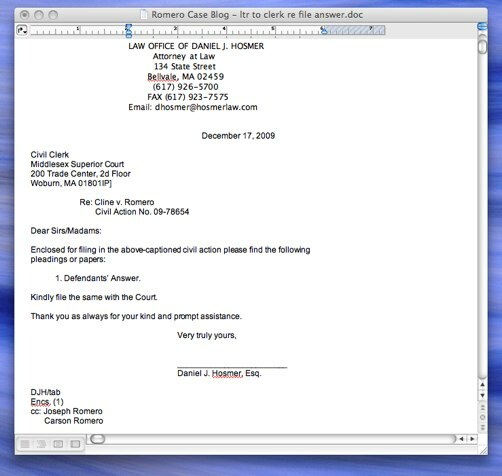 Last, but certainly not least, as this week the rent is due on Dan’s apartment, and it’s a payroll week at the office, in the Time & Billing section of Summary Judgment Dan makes a time slip for the hours he spent in preparing for trial. 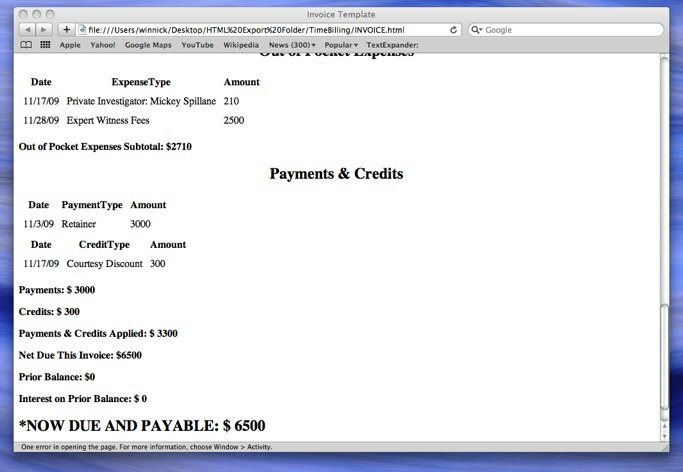 And he prepares an Invoice to send out to Joe Romero, Carson’s father, using SJ’s simple Invoicing subsection, which allows rapid collection of all of the relevant time and billing data which Dan has entered himself as the work progressed (e.g., time slips, expense slips, payments and credits, prior balance owed, etc. ), makes the necessary financial calculations, and produces an invoice which his client will be more likely to pay because of its simplicity and clarity. This concludes my Romero blog series. Dan Hosmer may return with other cases he uses Summary Judgment to manage. In the meantime I encourage all of my readers to consider attending the upcoming Tinderbox Weekend in Boston, March 13-14. The focus will be on Law, Journalism and Policy, and will feature several speakers, including myself, who will offer insights into the use of Tinderbox for legal applications, among other topics. I will be speaking on case management using Summary Judgment. For further information and to register go to: http://www.eastgate.com/Tinderbox/TbxWeekend.html. I hope to get to meet you there in person. “If you don’t know where you are going, any road will take you there.” Lewis Carroll, Alice in Wonderland. I’ve saved to this point in the Romero series my concepts of how to use Tinderbox’s™ and Summary Judgment’s™ mapping features. That is because the mapping features are perhaps the most powerful, but also the most esoteric and technically challenging to employ effectively; and, it has taken me a number of months to understand them myself. 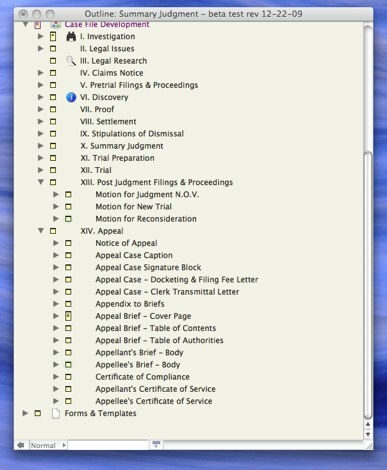 For lawyers, the Summary Judgment outline is designed to ensure that the tasks required to arrive at your destination, are performed automatically and effectively as the case progresses. SJ accomplishes this by digitally tracking the gathering, filing, retrieval, analysis and presentation of information a lawyer must logically follow to manage a case from inception to successful conclusion. For Tinderbox users generally, for whom there is not a ready-made roadmap leading to your destination, I recommend that serious thought be given at the outset of your problem or project to defining key elements for which notes and text are going to be gathered, organized, analyzed and eventually presented. For example, for a research and writing project — as in writing a novel, a play, an academic paper, a documentary work – to define preliminarily the key people; events; transactions; issues, etc. – that will form the skeleton of the research and writing. As alluded to in my prior Getting a Grip post, Tinderbox is extremely flexible in allowing revision and customization of these outline elements down the road, as the problem or project becomes better understood. But in my view, having a clear destination in conjunction with an initial structure for the note-taking itself, is indispensable to getting on the right road from the start. 1. Create a separate “container” or subfile for each key element by opening a TB “Note” for each. Click on the Note menu at the top of the TB screen. Choose “Create Note”. In the Create Note dialog box that appears, give the container/subfile an appropriate title (e.g., “People”). 2. Consider giving the container/subfile (and all notes that are to be filed within it) an identifiable color by using the pull down menu of colors in the Create Note dialog box. 3. Consider adding other distinguishing features from the Note menu such as a distinct “Shape”, “Border”, “Pattern” or adding a “Badge” (i.e., visual symbol/icon, e.g., a “red flag”). 4. 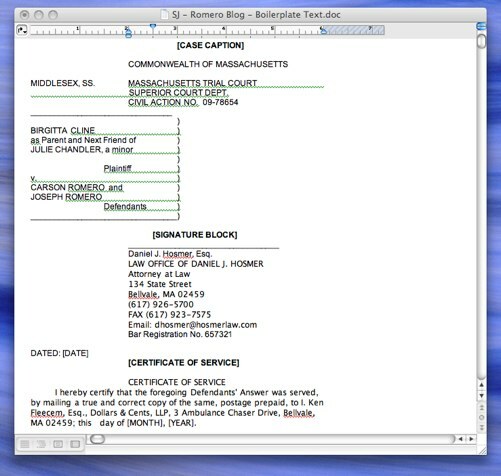 In the Create Note dialog box there is a section called “On/Add Action.” This section will allow you to create a “Prototype” form for the container, on which all other notes of the same type will be modeled (e.g., all notes relating to “People” will have the same characteristics such as shape, color, badge, etc.). As a result all notes filed in the container will have the same recognizable characteristics. In the “On/Add Action section of the container type: Prototype=”[Name of Prototype – e.g., “People Prototype”]”. b. In the Create Note dialog box give the Prototype the same name as the container designation for the Prototype (e..g. “People Prototype”). c. Importantly, check off the box marked “Can be a Prototype”. d. Create “key attributes” for the Prototype (i.e., elements that you will want to fill in and have appear at the top of each note created from that Prototype, which can later be used for sorting and retrieving notes based on the Prototype). 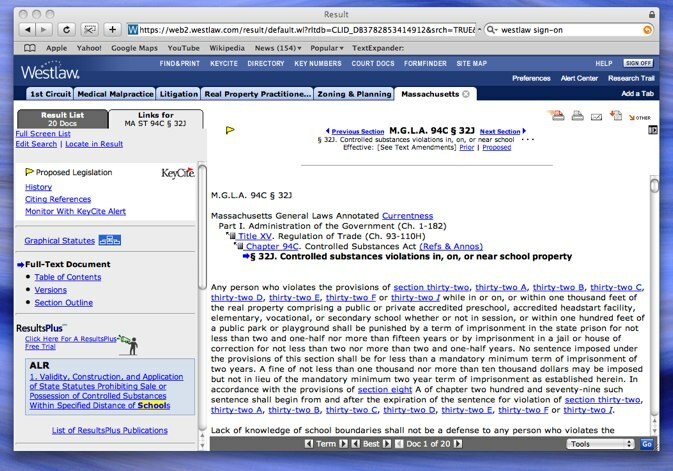 For example, for the People Prototype, key attributes might include the Name of the person; the Date of the note entered concerning that person; the Source of the text concerning that person; the Citation (e.g., to the book, research work, etc. from which it is drawn). e. Then add the same visual elements for the Prototype as you used for the container itself (e.g., color, shape, border, pattern, badge). f. Move the Prototype inside of its container by pressing the tab key so the Prototype becomes a subnote within its designated container. a. Open the container by clicking on the arrow alongside the left side of it to expose the Prototype stored or “nested” inside of the container. b. Click on the Prototype to highlight it. d. A new form of the Prototype will open and permit you to edit it by filling in the key attribute elements at the top and then inserting the text of the new note in the body of the note form. e. As discussed above, the new note will have the same characteristics as the Prototype itself (e.g., shape, color, badge, etc. ), and be properly stored where it logically belongs as a subnote inside of the container. 7. 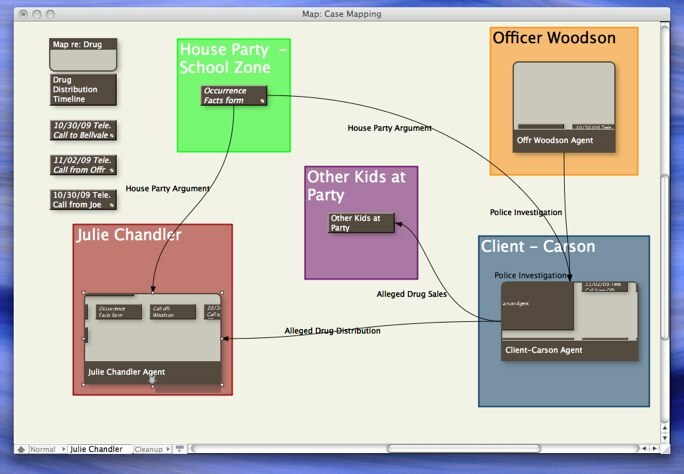 By following the same procedures for creation and use of Prototypes for the other key elements of your project, all of your project notes will be logically stored where they belong, easily distinguishable by topic, able to be searched and retrieved quickly, and in a form which lends itself to effective use of TB’s powerful mind-mapping features for analysis and understanding. The effectiveness of this approach to Tinderbox note-taking is demonstrated by the mind map shown below for “A Christmas Carol” by Dickens. 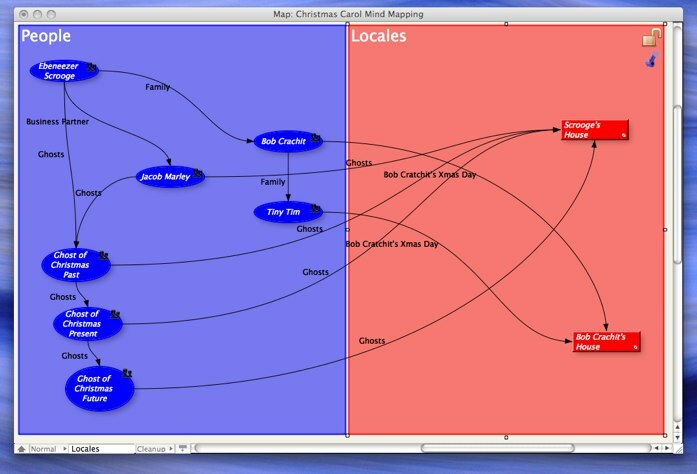 Distinctive prototypes for notes relating to the People and Locales were created at the outset, allowing an effective mind map to be made using a Tinderbox map view. 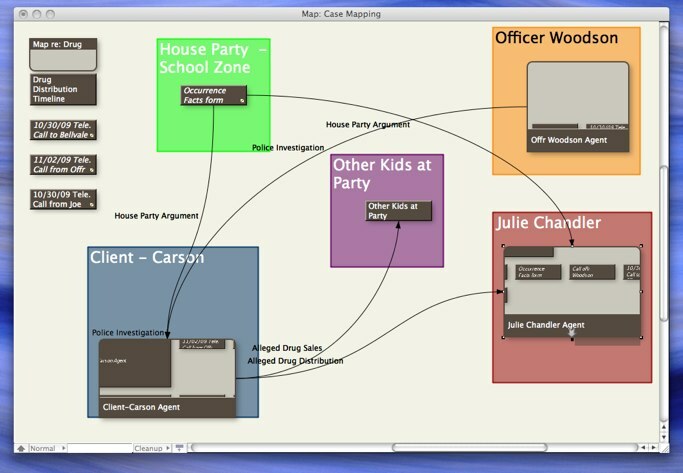 The mind map utilizes colored “Adornments” (boxes) to group text notes by category (i.e., for People and Locales). Because the notes are modeled after distinctive “People” and “Locales” prototypes, they are readily distinguishable by, for example, color and shape. Visual links created between the key persons and locales exposes their logical relationships to one another and the overall story.